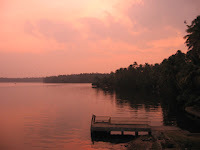 Left for Kollam on the 31st. Boarded the 2626 New Delhi – Trivandrum Kerala Superfast Express from Vaikom Road. But before that watched an ox getting slaughtered at the Panchayat Butcher. This is how it goes. They bind it with ropes so that it doesn’t move about much, wrap a towel around its head, and use a giant hammer to bang its head… thrice… and the mighty ox falls down with a thud. Dead. But as they carve up the ox, it begins thrashing again… as some remnants of life are still left somewhere… it’s a pretty gory sight!!! Kerala Express was jam packed with Lord Ayyappa devotees… like most other trains running through Kerala in the fag end of December. Wanted to try something different. 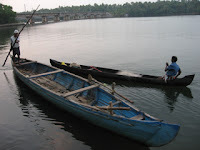 How about a ride in a vallom (traditional boat) in the magical waters of Kollam? Went to the boat jetty, found that a 1 hour ride on a safari boat cost around 600 Rs. Scrapped the idea. Sped on a bike with best buddy Subash to Perumon, Kollam, which is famous for being the unfortunate site for the worst rail tragedy in Kerala in 1988, when a train fell off the bridge over Ashtamudi Lake at Perumon resulting in the loss of over 100 lives. Before that stopped at a nearby railway gate and posed for pics on the tracks. Managed to shoot a video of a passing train: the Howrah bound Trivandrum – Howrah Express and took snaps of the Trivandrum bound 7230 Hyderabad – Trivandrum Sabari Express. 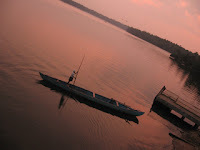 Got to the Ashtamudi lakeside, befriended the local boatman Unniraj, who took us on a ride around Perumon. Visited the local toddy shop, but found the atmosphere to be a lil shady; so escaped. 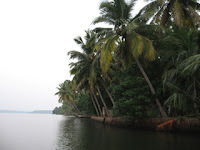 Yelped with joy as the big vallom sailed through Ashtamudi Lake and the water birds hovered around us in the twilights. Unniraj waited for us, as I hogged a double omelette and walked along the Perumon bridge and took snaps, unfortunately couldn’t capture any passing trains. It was dark as we took the boat ride back. Loved it. And the entire experience cost only 100 Rs. 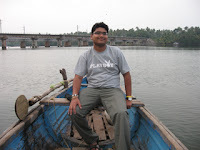 Any of you interested in boat rides across Ashtamudi Lake, just get in touch with me to take Unniraj’s number. Got back to Kollam and decided to welcome in the New Year with a sea food dinner at Hotel Shah International followed by watching Mammooty’s ‘Palunku’ at Pranavam theatre, Kollam. Touché! 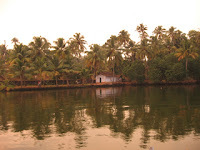 Type ‘Kerala’ in the ‘search tags’ field in the top right corner and click ‘Go’.